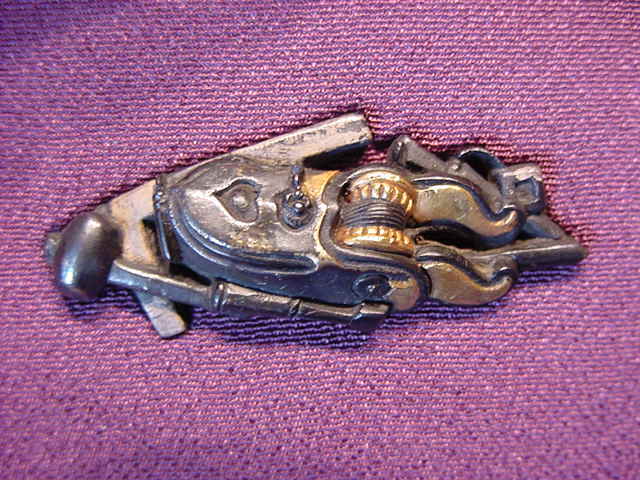 Among the many schools of fittings makers throughout Japanese history, the Goto are dominant in their longevity and success, and eminent for their craftsmanship. Sixteen generations of mainline masters descended from the first generation, Goto Yujo, who worked for Ashikaga Yoshimasa than one hundred fifty years before the unification of Japan under the Tokugawa Shogunate. Successive generations of Goto makers sustained and improved the quality and workmanship, and later were influential in the birth of other great artists such as Ishiguro, Tomei, Iwamoto, and others. Goto fittings became standard sword attire while engaged in formal official duties with the Shogun building uniformity among the various Daimyo’s accoutrement while providing identity without garish appearance. The depth of knowledge regarding various metals, their purity, and alloying technology in conjunction with the power and social standing of the Goto family eventually gained them the responsibility for gold reserves and coinage in the treasury. Goto works drew the attention of the noble and merchant class alike. 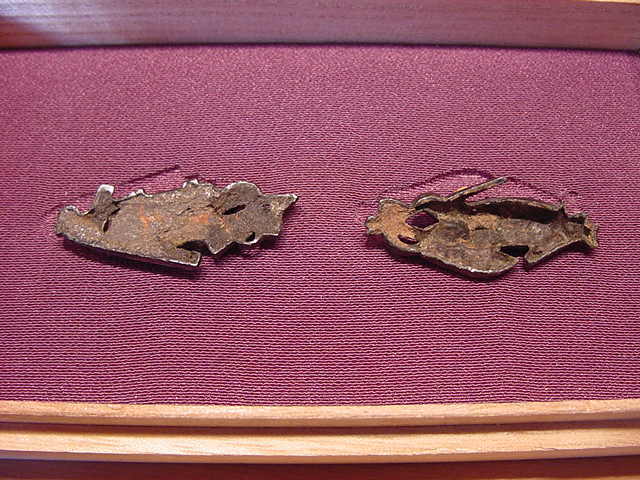 Fittings made by Goto masters were especially precious and sets such as Mitokoromono (kogai, kozuka, and menuki, en suite) were used as precious exchanges of gifts to and between Daimyo and those of lofty social classes. So much was the emphasis of use for these precious hospitalities that demand far outstripped the supply and it became increasingly difficult to fulfill delicate social obligations due to shortage of availability. Those with the means sought to unify a collection by installing items from each Goto generation, a practice which continues to this day by enthusiastic aficionados. Truly, this was an early example of the phrase “collect the whole set”. The importance of owning specific works brought many owners of items to bring them to Goto masters for authentication, and on many works one can see the testimony of later generation’s attribution of a particular piece to a particular master. As one might imagine, the inability to provide a good attribution to an item belonging to someone of influence could prove quite a diplomatic challenge, and the pressure to provide good attribution could sway the appraiser to document a favorable assessment regardless of the actual origins of the piece. 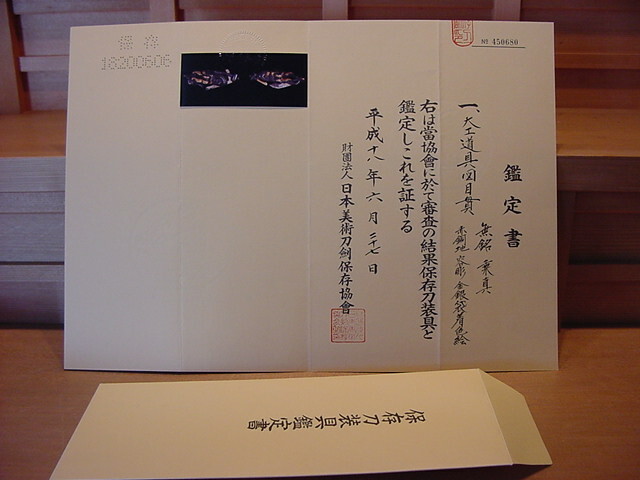 Of the seventeen generations of mainline Goto masters from 1440 to 1879, the first three generations are known as “Ko-Goto” or “Old Goto”, and consisted of Yujo, Sojo, and Joshin. Joshin’s work was born in the fury of the “age of battles” when the provinces of Japan were at continuous war. Although he excelled in the designs that all Goto traditionally made such as Dragons and Shishi, he favored powerful symbolic subjects such as Tigers as well. He was a man of duel occupations which divided his time, spending only a smaller portion of this time making fittings, while the majority concern was as a member of Samurai class with military responsibilities to attend. Henri Joly wrote of him “well known as a doughty soldier”. Naturally as can be imagined from his turbulent surroundings, many of the works he created reflect his military influences with renderings of canteens or equestrian tack such as bits and bridles, stirrups, and the like. By comparison to the average lifespan of the various Goto masters, Joshin died relatively young at the age of about 50 years old. Additionally, when considering that this would have provided him with only about 30 years of individual works as a part time maker with a larger outside occupation, his yield would be fewer in number when held to other longer lived masters of 70 to 80 years. For this reason, in addition to his skill, his works are highly sought. 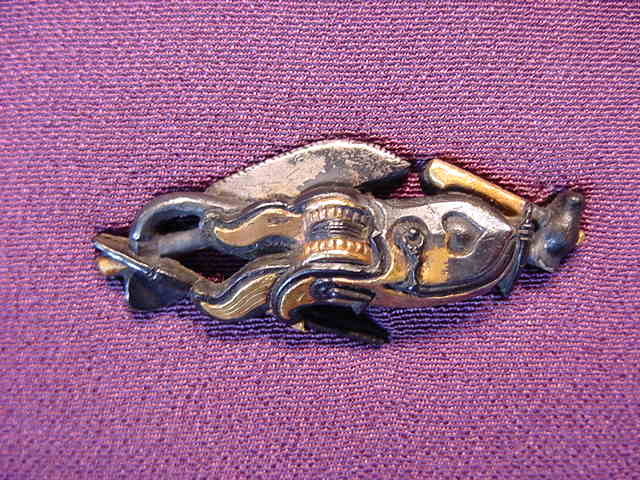 The subject of these menuki are that of a carpenter’s set of tools including a square, mallet, chisel, hammer, saw, awl, and central to both menuki is the Sumitsubo, or inkwell snap-line. All the items are unique, but only the Sumitsubo is replicated on both, which personally I find quite amusing because it harkens the adage, “measure twice cut once”. The workmanship and detail is phenomenal. Looking carefully, one can see the incremental marks carefully lain out and engraved on the square. The Goto were known for the quality of their shakudo and these do not disappoint. The color is a deep, rich crow’s feather black, with skillful overlay of silver and gold accents. 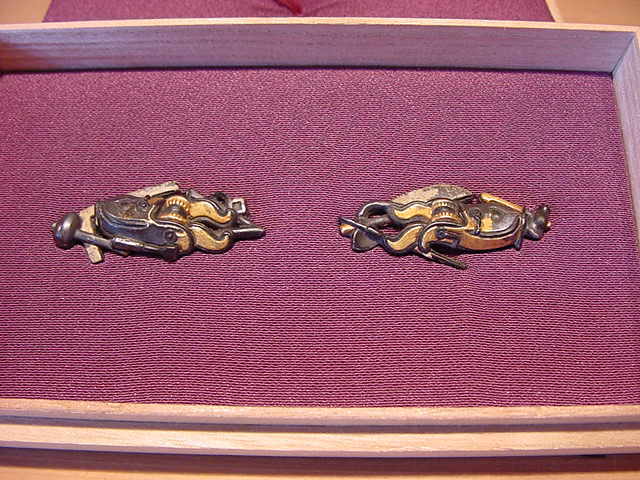 These menuki are a paradox for Goto Joshin the Samurai. In a world filled with destruction and turmoil he chose not the tools of military use, nor the haughty symbols of metaphorical military spirit or personal formidability, but the subjects of tools that rebuild and create demonstrating a sublime recognition of responsibility to a higher calling. I believe these are a fascinating glimpse of a multi-talented craftsman of uncommon awareness. Sadly, he would never see peace in his time, but I believe these menuki demonstrate the vision of the quintessential Japanese warrior that understands creation is far more challenging than destruction. These menuki have been awarded NBTHK Hozon Kanteisho documenting their authenticity and quality. They remain unsigned, as they were created, just as Joshin intended.